We walked hand-in-hand, wondering aloud to each other, “When was this built? What do you think that sign says? What was this place like just before the fall of the Soviet Union?” It was the first time in three days in St. Petersburg that we had actually just wandered around. We had been going at break-neck pace so Rick could research and update his guidebook chapters. Finally enjoying a leisurely stroll along Nevsky Prospekt was a welcome breath of fresh air. Changing pace from researcher-mode to traveler-mode allowed us the chance to see and do things we’d otherwise miss. With cameras at the ready, we lingered in front of elaborate storefronts and lollygagged across statue-adorned bridges. We moved slowly in the fast city. Well-heeled, nouveaux-riche Russians strode confidently with iPhones in hand. No-neck thugs walked three-abreast–bullies ruling their bit of sidewalk and assuming others would move out of their way (and they did). Bicycles, beat-up Ladas (tiny Soviet Union-era cars), trolleybuses, and ramshackle mini-buses sped down the avenue. 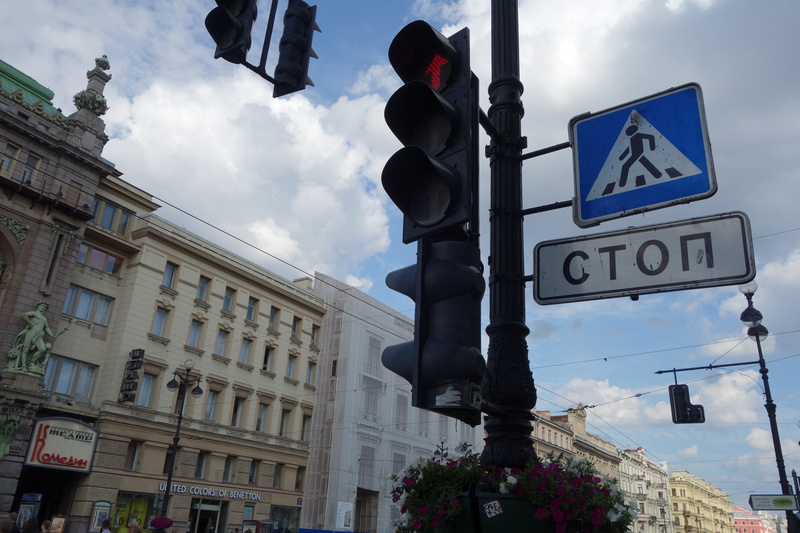 Thankfully, I recognized the Cyrillic transliteration of “Stop”. About to enjoy a much-needed coffee break, I saw a petite old lady resting against a wall. It seemed liked everyone was passing her by without a single glance. Although it must have been 80 degrees, this elderly and frail babushka was cloaked in a heavy sweater and covered her head with a faded scarf. Was she resting from the heat? Was she waiting for a loved one? Was she a beggar? I had to stop. I asked Rick if he thought she was OK. As we both turned back to look at her, a no-neck approached her rapidly, and I stiffened. But then I saw him hand her a piece of fruit. She accepted it gratefully, he walked away, and she leaned wearily back against the wall. “We should check on her,” I said. Rick agreed but let me go alone. Maybe she reminded me of my late grandmother. Maybe I was craving human contact in this country that still felt impersonal to me. Whatever it was, something strong drew me to her. I wanted to know: was she homeless, hungry, sad, scared, tired, or lost. I wanted to make sure that she was all right. I needed to. She was so tiny. I’m barely 5’2” and I towered over her. “Dobryy den’!” She titled her head, looking towards me inquisitively. I greeted her once more and asked, “Kak dela (how are you)?” As I waited for her response, I marveled at the softness in her glance and the crinkles on her face. I wondered how old she was. She must have been well into her 70s–old enough to have lived through the horrific 900-day Siege of Leningrad, the thrill of Sputnik, the chaotic fall of the Soviet Union, the dawn of Russian democracy, the rough and tumble birth of capitalism here (which cruelly left the older generation–her generation–behind), and the rise of Putin and the oligarchs. A light bulb went on for her, and it looked as though it were illuminating her from within. Suddenly her eyes got even warmer. She was filled with energy and began telling me some kind of story. Without pause, the words tumbled from her mouth, and I watched her expressions intently to try to grasp any clue as to what she was telling me. For several minutes, I watched her furrow her brow, look longingly in the distance, and grimace at painful recollections. She looked at me both gently and piercingly, as if forcing my understanding. Clearly something terrible had happened. I wanted to respond but didn’t know how. She must have seen the concern on my face, but she continued on with her story. She needed to share it with this American. As she recounted more of the tale, she gripped my hand began smiling broadly. Repeatedly and fervently now, I heard, “Oh!…Amerika!….Oh!….Amerikanskiy!” Had she met Americans before? Had they helped her out of whatever trauma had occurred? Was she talking about the past or was she referring now to me? 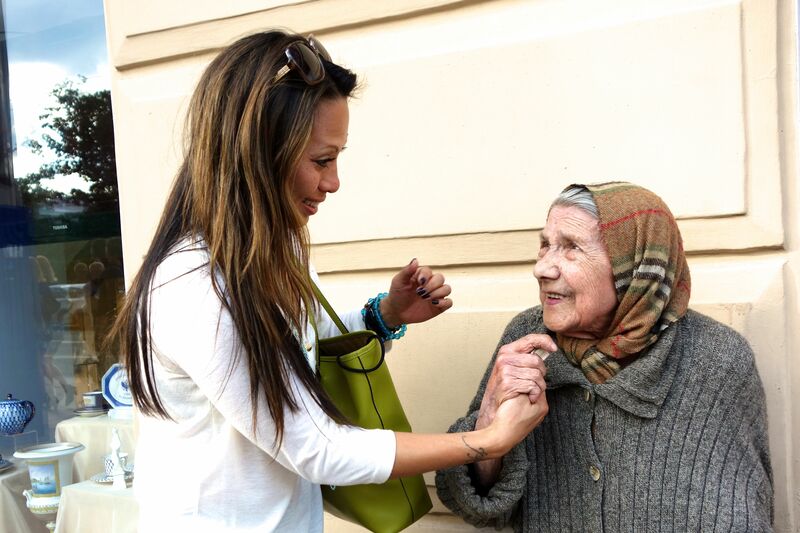 This fragile, one-armed babushka–so seemingly by-passed by the modern bustle–let out sighs of joy and gratitude every time she mentioned America, and my heart melted a little more with every smile I saw on her face. Here we were, standing next to a wall on a Nevsky Prospect sidewalk. Two complete strangers from two very different worlds sharing an intimate and precious moment. We may not have been able to comprehend each other’s languages, but in that space and time with my dear babushka, I think we both somehow understood each other on a much deeper level. I knew I couldn’t stay much longer, and I didn’t know what I could do for her, but I reached into my pocket, took out the 300 rubles I had (about $10) and gave it to her. She tried to refuse, but I said, “Pozhalusta. Please.” She started to cry. I started to cry. We held hands and then she hugged me. I gave her a kiss on the forehead. She told me, “Spasiba (thank you).” We hugged tightly once more and parted ways. I thought I was going to be the one to help out a poor, little old lady. Turns out, she’s the one who helped me. She gave me the most memorable experience of my entire two-month trip. 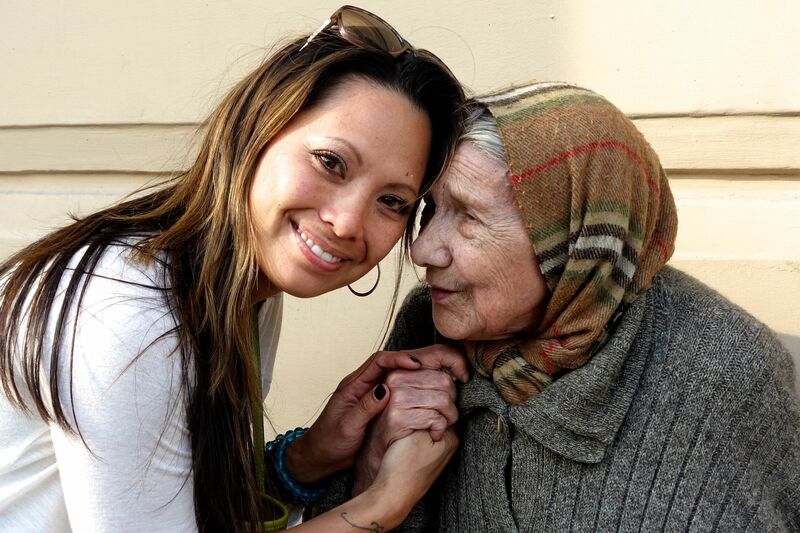 No museum, no church, no tour, no meal could ever compare to the way this woman made me feel–connected with a slice of humanity that I would otherwise never have known existed. Travel is so many things, but it is nothing without the connections we make with the people we meet–even when your common vocabulary is ten words. Whenever I think back to memories of St. Petersburg, it’ll be that smiling face set in wrinkles and shaded by a faded scarf that I’ll remember most vividly and fondly. Sweet story:) I’ll bet the no-necks were watching you closely! Hi, Grace! Thanks for watching Rick’s shows, and double thanks for reading my blog. I really appreciate the support. Go Marching Sundevils! That was a beautifully told story. Very touching and real. Thanks for reading the article, Patti! I really appreciate your support, Helen. Thanks! “She gave me the most memorable experience of my entire two-month trip.” So sweet- and isn’t it true?! My husband and I feel the same way about travel- it is the culture, people and the unexpected interactions with others that make trips extra memorable. Definitely, Jenny! I hope you and your husband enjoy your continued travels and that you make great personal connections, too! Be well, travel well. Thanks for sharing this lovely encounter! No matter how foreign the places we travel to, it all comes down to people that makes the traveling a rich and beautiful experience! Like most cruisers to St. Petersburg last summer, we only managed to visit Hermitage and had no contact with any Russians (except our beloved tour guides). Your experience is priceless! Thank you for commenting, Virginia. Didn’t you love the Hermitage? Although you didn’t get a chance to interact with other Russians (other than your guides), it’s great that you maintain the travel philosophy of enriching your experiences by engaging with the people whose cities you visit. I hope you have many adventures in your future. So very heart warming… thank you for sharing your experience with us. Heading to this area next September & am really enjoying your perspective. Bonnie, thank you for taking time to read it. I’m sure you’ll have so many memorable experiences on your trip. Be well, travel well. Thank you for sharing you warm and wonderful story! Having had the opportunity to travel abroad is a wonderful way to become an ambassador of friendship from the USA, which is clearly what you accomplished here with the tiny sweet Babushka! What a treasure you discovered! I’m thankful that you enjoyed the story, Ninfa. I used to tell my students a similar thing when I took them to Europe each summer–we are essentially ambassadors of our school, our city, our country. It’s important to share the best of who we are and what we represent, and it’s equally important to see beyond what we think we know about other countries and to open our minds and hearts to learn from their cultures. I lived in Ukraine for a couple of years, and my babushka (mother of my host mom) would often come over when she knew I was home, tap on the window and have me lean through so I could pluck an apple from her hand or fetch the bowl of vareniky she’d just made. She would come over and show me old photo albums and tell me in Russian about life during the Soviet Union, and that interaction was one of the most meaningful and memorable I had during my time there. Priviet, Trina! Thank you so much for sharing that. That conjures up beautiful images. You are so fortunate not only to have lived in another country but to have developed quality relationships. It deepens the experience, and as you noted, creates meaningful memories. Take care! I just took a close look at her hand clasping yours. That’s a people-to-people connection that good travelers can make happen. If you don’t stop and start that conversation…it’s not likely to ever happen. Great and vivid article. Thanks. Thank you, Rick, for having the wherewithal and presence of mind to capture that on film. I will probably never forget this woman, and I’m so glad I will always have photographic documentation to remind me of her beautiful face and her loving spirit. I’m glad we shared that experience together. Beautiful moment wonderfully told…thanks for sharing! Amy, thank you so much for saying that. I’m grateful that you take the time to read it and that it resonates with you. Take care! Oh Trish, you have such a lovely heart! Thank you for sharing this wonderful interaction with us and reminding me what is truly important in life. Barbara, wow! Thank you for your generous and kind words. This babushka could melt anyone’s heart. We all need kindness and it’s so easy to give it to others. Sometimes it’s just hard to remember to do so. Take care! That’s a beautiful story Trish! We just came back from a 2 week trip from Europe. We visited 7 countries and 9 cities, starting from Amsterdam that ended in Helsinki. Reading this story reminds me that it’s a far more meaningful experience in having an interaction with the locals when you are travelling like this. Thanks for writing this inspiring story. Thank you so much! You must have had a whirl-wind trip! What a beautiful part of Europe to visit! I hope you, too, made beautiful memories from your experiences with the locals and that your continued travels are full of meaningful interactions. Take care! Such a joy to have found your blog! We have traveled throughout Europe and next spring we will be in St. Petersburg. Your encounter with that sweet woman should be what Americans are all about when traveling abroad. We can learn so much about their history and the people by just a simple connection. Bravo, Trish. Hi, Suzanne! Thanks for taking the time to read the blog. Have a fantastic time in St. Petersburg. If, on the incredibly slim chance that you should see this woman on Nevsky Prospekt, please give her one more hug from me. If you need a superb guide while there, let me know. I can pass on the contact info for Natalya, one of our four excellent guides that Rick and I used while in SP. I hope you make beautiful personal connections on your trip and that you make lasting memories. Be well, travel well. What a beautiful story! Thanks so much for sharing it. Thank you, Nancy, for reading the article and for your kind words. Take care! Your description of this encounter put a smile on my face and warmed my heart. I couldn’t agree more about the importance of true people to people experiences. Whether it was a cabbie in Paris, a bowler-hatted gentleman in London or a handsome waiter in Verona, conversations with these people are some of my fondest memories. A year ago, I prepared a meal for a friend who was living temporarily in Treviso Italy. My shopping experience for that meal had me dealing with butcher’s and shop keepers who didn’t speak English and our methods of communicating brought smiles and laughter to both of us. Yay, Sharon! Thank you! And your story underscores the truth that if you get beyond your comfort zone and not worry about how well you speak the language, you can have good and even great experiences. I think we all want to be understood–whether in our own language in another culture’s. When we step forward to meet someone halfway, they’re more willing to take that step, too. Be well, travel well! Great to get a glimpse of real Russia, we mostly get our impressions from just a tourist vacation perspective. Also great to get to know who is taking the pictures. Great job! Hi, Judy! Thank you for being a regular reader of the blog. I’m really grateful that it resonates with you. I was just reviewing some of your previous comments, and you really seem to travel quite a bit yourself! Do you have future trips coming up? Good to hear back from you. We have traveled with the help of Rick for over 10 years to Europe. We would never have been able to make these trips and also afford them with out RS, he really has made it so easy for us. But in October we are flying from California to Pennsylvania and see American history. Spending time in Philadelphia and Gettysburg, Harrisburg, Lancaster and rounding it off with a couple days at Niagra Falls!!! This will not be an end to Europe at all, just seeing some of our country too now. Kudos to you! The last time I visited Pennsylvania was more than 25 years ago (my mouth just dropped as I typed that) on a summer high school band trip. I’m so grateful to my band director and my school for the opportunity to visit The City of Brotherly Love. We also performed in Washington D.C. Visiting sites in those two iconic cities of American history and government like the Liberty Bell, Liberty Hall, the Lincoln/Washington/Jefferson Memorials and Arlington Cemetery will affect even a pimple-faced teen in ways that stoke pride in and love for one’s country. Rick and I were in DC this year for the Inauguration, and those patriotic emotions were even stronger this time around. I wish you a very memorable trip to Pennsylvania and Niagra Falls. Such a great idea for a trip! What a beautiful and positive encounter, Trish. Thank you so much for sharing. It’s a reminder that simple acts of kindness and heartfelt human contact are sometimes all that we need. The photo of you holding hands is so touching and speaks volumes. Beautiful! Hi, Gayla! Thanks for taking a look at this article. You’re so right about kindness and human contact. It’s so essential and so simple to give and receive. I know I’ll never forget this encounter with my babushka. Take care!